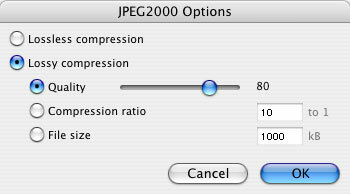 The support of the JPEG 2000 format enables SilverFast's strongest compression to process such data 3 to 7 times faster than Photoshop. In combination with SilverFast's HiRePP function, even 3GB files may be compressed and re-opened very quickly. It is important to note that Photoshop internally calculates with 15bit, while SilverFast uses true 16bit! This tool is included in SilverFast SE Plus, Ai Studio, DC Pro Studio and HDR Studio.